Mrs. Suggs recalls, “We first started out breeding Dobermans, around 1959. 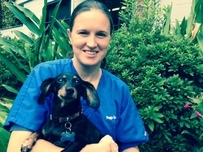 My husband, Cecile Eugene Suggs, was working full-time at the post office when a local veterinarian suggested, that because we had the room, that we begin taking in dogs for boarding.” The Suggs also wanted something for their eldest son, who has a disability, to do something that would help him learn a skill and keep him busy. Initially, they took care of a few dogs and then it spread by word of mouth. In the years since, the initial Suggs Kennel building has been extended and a separate annex building was added on too. A little skeptical initially about boarding pets, Mrs. Suggs didn’t think that people would bring them. But, they did…and today 53 years later they are still happily taking in pets for boarding and grooming. "Our Staff has been around animals for most of their lives and really love what they do!" Has worked for Suggs Kennels since 2008. Ashley grew up with animals such as goats, cows, dogs, rabbits and chickens. She has a 3 year old Rottweiler named Hayley & recently added chickens to her family. Her passion is to play and work with animals. She also likes to see the different personalities of animals and is a natural at working with them.